You grow up hearing about it and think it's this wild place with no people, just some of the world's biggest, most dangerous bears and lots of scared little deer, and stories suggesting it should have been named Kardiak Island. But upon touchdown, you learn it has a real airport, a Best Western, a Coast Guard station, decent restaurants and thousands of people. The myth is shattered&apos;¦how could a place be truly wild with all that stuff? Step about 50 yards into the bush, that oh-so-dense and dark wet brush, and you find out in a hurry why Kodiak Island is still called The Rock. "The brown bear threat is greatly overhyped," said the men running the Sundy, our 56-foot floating base camp. "They don't come running to the gunshots like everyone says," they told me. "Few real problems," they promised. I hit the beach the first morning with Len Nelson — two Kodiak virgins with no guide — and we hunted along the sand and rock shoreline probably 30 minutes, admiring huge bear tracks, before cutting inland through a thicket to a small rise overlooking the thicket, which now lay between us and shore. And just like that, your months of pre-trip fears are realized. The unmistakable sound of a very large, very angry animal, very close, from the thicket below. It sounded like a lion's roar segueing into an outboard's propeller chopping thick mud after running aground, or a V8 with a blown exhaust manifold missing on two cylinders. Except cars with bad exhaust don't leap from the brush to tear your throat out. "What was that!?" Len said urgently, hunching behind his .300 Win. Mag. "I'd say by the way you're holding that rifle you know exactly what that was," I said to him, leaning forward, my gun raised. It sounded like the prelude to a charge, a warning, maybe 50 yards away. I walked to the edge of the ledge in front of us above the thicket so I could see more. If he was coming, I wanted to get a shot before he suddenly popped up 12 feet away. For emphasis, again, from the thicket: "Broowow-ow-oowow-grroowwrr." You don't have to tell us three times. We got the hell out of there, walking back-to-back, moving through dark blowdowns. The only sound was rain and wind, but we "heard the footsteps" all day long. I started glassing from a cliff an hour later and turned to see Len with his back to me, covering the woods behind us. We did not like being backed against the cliff, and left. We agreed not to shoot a buck unless it was a monster, knowing we would probably never get a deer out of this spot, based on all we'd heard. The Rock has always been a harsh place. Russian fur traders took over in the 18th century, enslaving the Aleuts and killing off 85 percent of them, forcing the natives to hunt the sea otters they revered to near extinction (the otters are everywhere today). In 1941 a fort was built to fight the Japanese, and in 1964, just five years after statehood, the Alaska Earthquake sent tsunamis 30 feet high to the island, killing 15 people and destroying the fishing fleets and Standard Oil. The Navy SEALs train here at a special cold-weather warfare detachment. The weather is famously savage. And I'd heard plenty about the bears. Five feet high at the shoulder, males averaging just over 1,000 pounds, and an unbelievable population density of a bear every .7 square miles! Tyler Meinhold, a guide friend who knows what it's like to kill an attacking record-book grizzly at 15 feet with a 12 gauge (and have the gun jam), told me to bring a big rifle, don't fight bears for deer and that the island is infested with them. "You may have trouble finding a brown on the mainland, but not Kodiak," he assured. The leader of our trip, Doug Jeanneret, of US Sportsmen's Alliance, admitted that they'd had conflicts in past trips, including a guy who had to shoot a sow that stalked them repeatedly. A pair of Doug's hunters had a bear circle and steal a deer from them WHILE they were dragging it, pulling it right from their hands. On the plane ride in I met an accountant who hunts tribal land because he works for native corporations, and he said, "We call it The Rock because it's all by itself way out there in the middle of nowhere, and the weather just slams it uninterrupted by terrain. "You've never been, huh? It's a beautiful place, big mountains, huge views, lots of lakes and bays, tons of fish and wildlife, a wild place, so pretty, but it just gets blasted by Mother Nature. I hope you get the good Kodiak, 40 degrees, blue skies; it can really be amazing. But lots of search and rescues out there." He'd just returned from an early high-October Sitka blacktail hunting trip that'd been delayed four days because of 70-mph winds. Had he seen bears? "Oh yeah, we were eaten up," he said. "Three camp raids in seven nights. They ate our deer, ate their heads, ate their brains, ate their jaw bones; they especially seemed to love to eat their antlers. I woke up in a tent with three brown bears five feet away." Gulp. He told me he hunted with a .25-06 (?! ), and I imagined a hungry brown picking his teeth with that thin barrel after eating him. "My friend had a bigger gun, though, a 7mm mag," he said. (A bigger gun? Really?) He'd killed a 71-inch moose with a 7mm the year prior, he said, and it had run 300 yards before dropping. 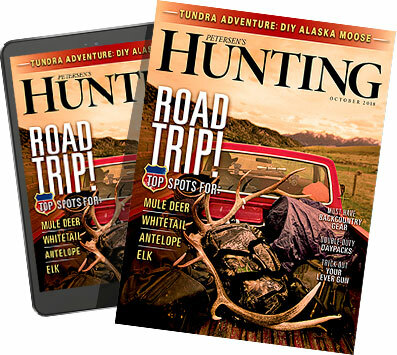 On this trip, I was packing a Remington 700 XCR in .300 RUM, a black nitrite-coated stainless beauty shooting their 200-grain Swift A-Frame 3,000-plus-fps extended-range cartridges, topped with a Cabela's Alaskan Guide 3x9 scope. The gun is just over seven pounds, but with those loads it packs more energy than a .338, so it kills at both ends&apos;¦an ideal deer gun for a place with 1,200-pound man-eating raccoons. The bears are hardly hunted on tribal lands, "So we saw dozens of bears in seven days. All day, every day," he said. "They ate everything, even the skull plate; we just found these little slivers of bone. If they come for your deer, they never stop." A woman on the plane told of the heartbreak of bagging a huge buck after years on The Rock, of getting it down to the beach only to have The Man in the Brown Suit show up and pick it up like a Lab grabbing a newspaper and trot off with it. You could still see the disappointment in her eyes. So&apos;¦why bother? What is the obsession with these little deer? I was leaving Illinois, land of gagger whitetails, to hunt deer where a trophy is considered anything over 75 inches. This was like leaving Hawaii's North Shore to surf Lake Michigan. But in reality, hunting The Rock is everything that hunting used to be, the antithesis of walking through a field to hunt a woodlot whitetail in a place where even a kid couldn't get lost. On Kodiak, you will see things you've never seen. Flying over the mountains toward Larsen Bay from Kodiak City, it was bigger country than I'd imagined. Giant slopes with new snow that begged for a heli-drop by a ski video team. Two days later I would stand with Doug on a hillside and watch whales spout and roll off the point below, counting sea otters, when a golden eagle in full tuck dive at Mach speed ripped just over our heads within a few feet, startling us with the jet engine noise, as it tore into a flock of seagulls just below. And the whole time, you have an eye on the bush, looking out for a giant bear, and another eye on the sky, watching for that treacherous weather to change. And, oh yeah, the deer. On day one, Luke Hartle, the young tough guy from our party, shot a whopper 5x5 buck hot on a doe, just like that, a much bigger buck than he or I ever expected to see — 16 to 18 inches wide, tall, tines sticking everywhere. 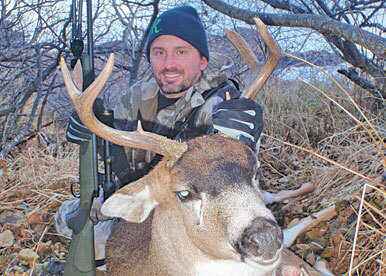 The next day, Jay Cassell had a close chance at a good one, but his glasses fogged from rain. Soon after, he dropped a heavy 5x5 that ran out and started hooking a bush 50 yards from him, rubbing. The rut was on. Turns out, though, Sitkas are no gimme. The rest of us had seen no bucks yet, and neither Luke nor Jay would see another good buck the rest of the trip. Despite the supposed 80 percent success rate on Kodiak, I talked to many guys in the airport who never saw a good deer. A whole group of bowhunters on another boat blanked for the entire week! Luke and Jay had both hunted with Kodiak veteran Joe Arteburn of Cabela's, who is just a guy, not a guide...in theory. But they both described how he'd led them to their big bucks and muttered, "Shoot him." Arteburn either had the hot hand or was a great hunter, I didn't know yet. With glittery, mischievous eyes and a wry smile to off set the acerbic comments that puffed from the corner of his mouth that didn't have the pipe in it, he's a caricature of the seasoned woodsman, so I had a hunch. We all wanted to see if he could keep the streak going. Hunters chase blacktails here many ways, landing in lakes by plane, tent camping or backpacking. The classic way to do it is a boat hunt out of Larsen Bay, gorging on halibut and crabs caught fresh, shooting ducks, the waves gently rocking you to sleep at night. I'd anticipated an adventurous but easy hunt for little deer, but was wrong on every level. The hills are leg killers, for one thing. We quickly learned that the big bucks are rarely down low until a big snow, and getting dead deer out is brutal because there is no time for boning and packing meat 'cause that's a great way get a bear in your lap. It would prove one of the most physical hunts I'd endured as a lifelong elk maniac. And the deer are not small, but blocky-bodied brutes, 175 to 200 pounds, and to my delight, their antlers are plenty big to make your heart pound. The first three bucks we killed had great mass. One rack in the airport went 20 inches wide, and a photo from the Ninilchik charters site (ninilchik.com) showed a 130-plus monster a guy killed while it was standing on the beach with 13 other bucks, the kind of thing that can happen late in the season. Weather gets worse then, though, and if you wait too late their antlers start falling off. I saw only one good buck in six days. Heavy deer sign is everywhere, but the brush is so thick, there are few good areas to spot them. Joe and I started day three in a bay with marvelous open vistas. It looked much like the Snake River country back home, much more open than the dense brush covering most of the island, but the area is only accessible in the rare event of nonprevailing winds. We spotted a smallish buck right off, and I wanted to take the 415-yard shot since I had two tags and enough gun, but the deer slipped away. Another memory: I started to walk off to relieve myself in some brush 20 yards away. "Take that with you," Joe said, nodding at the .300. "You never know where the bastards are gonna be." He was not talking about deer. We hiked straight up, and while pinned to a steep hill, the same smallish buck popped out behind us on a bench where we'd eaten lunch. I decided if it's a three-point I was going to pop him since the trip was half over, I had another tag and I'd heard these were the best eating deer on earth. Then Joe whispered the f-word — "forky" — and I went limp, deflated. We moved uphill and glassed amazing country. We saw deer, no good bucks. And after finding sunglasses and footprints, I was realizing that even though Kodiak is 90 percent wilderness, it's tough to access, so the boat captains tend to drop deer hunters in the same spots. These deer were definitely pressured. another big buck hanging in camp, I was starting to feel like that guy. There was still a little light, so I picked a good spot, the lunch table bench where we'd seen the f-word buck, and told Joe we should watch it for 10 minutes, what the hell, and "besides, the thing wrong with today's hunt is you never smoked your pipe." He agreed and pulled it out. Two minutes later I saw the buck, standing in deep golden grass on a steep shoulder below a rock outcropping where I'd stood myself five hours earlier. Even at 165 yards, he was a stunning creature, with white double chin patches and a white chest against a dark chestnut coat, and the blackest black boss on his head. I could tell it was a buck, but not how big, making sure to peep through the scope instead of the binocs to avoid that rookie move, because the deer was alert. I asked Joe what he thought, but he was already covering his ears. "Shoot him," he said with his entire face, mouthing the words. "Shoot him." My heart raced, but the crosshairs were rock steady with the bipod. The hike to the spot where the buck had stood took 20 minutes, it was so steep. I could smell the hot, musky scent of the deer, but could find no blood. As always, in that instant, I couldn't remember the shot clearly. He'd hunched and run back around the knob, faster than I could cycle the bolt. I could not believe my eyes — we were using monster bear loads&apos;¦ I had to think if I'd hit him he'd drop hard, if not back-flip. Yet the shot felt good. Joe taught me something there: Do not quit watching after the shot, ever. He'd spotted alders shaking well after the boom, and he found the buck 35 yards away, where he'd not only run from sight but blasted through a dense alder patch. With no blood, I'm not sure I'd have found the deer in time with darkness falling fast in the worst area in the world for predators. We found him jammed under a tree, a heavy 4x4, and I trembled with gratitude. Front shoulder smashed, opposing hindquarter smashed, everything between jelly, and this tough critter ran that far on two legs. Unreal. The cold reality: My cannon would drop no 1,200-pound angry bears instantly. I dressed the deer, handed Joe my pack and rifle while he watched for bear, and commenced the harshest deer drag of my life, a mile of hell down a steep muddy creek through log jams. The buck looked like it had suffered a bear mauling by the time we reached the bottom, and I had to pitch it over a short cliff to reach the beach. I hated to drag it, but to bone him out was to risk bad company. The thinking is, leave a gut pile and it may draw the bear away from you. Bone-sore, exhausted and the pressure off, we took a field day the next morning, chasing fox and stunning Harlequin ducks on the beach all day, so the critter pile on the transom by sundown looked like a Turducken of fur and feathers, with five dead blacktail presiding and a few stiff cod I'd jigged up for crab bait bearing silent witness. Our hunt party camaraderie was something rare, with a duel of wit and practical jokes between our captain Rick and the young and mildly delinquent skipper of our sister boat, stealing each other's tender skiffs and such silliness. The last day of the hunt, Cassell and I hit the timber and watched a small spike 250 yards away walk slowly toward us, hit our wind, spook, then calm down and finally pass within 15 feet of Jay, apparently deciding it was safe since we were not a bear. Just 30 yards uphill, we ran into snowshoe-sized tracks with four-inch claws, from a sow with cubs, and soon after more tracks from an enormous boar, all just a few hours old at most since a light snow fell that morning. We were covered in bears, basically, and decided to only shoot a deer if it was a really big buck. Far away, we saw other hunters getting moved around by skiffs too early to quit, and without hearing shots. There could only be one reason for that, and I confirmed later that they'd run into an ornery sow and grown cubs, likely the same bears that had terrorized me and Len on the first day. A big boar walked within 70 yards of our other party as well this last day. Fear Factor, right up to the end. Intercoastal and honestly, I would do it again just for the crab feast. There's not too much to say about it, but I am still ecstatic about the pots we hauled full of giant tanner crabs. I've killed a lot of deer, but never gorged on crab like that. The Dungeness crabs I grew up on tasted like Krab-with-a-"k" by comparison. We put an exclamation point at the end of the voyage by jigging up six halibut just before we made port, enough for all to take home fresh slabs of Alaska's finest. Throw in thrilling, sometimes terrifying spot-and-stalk hunting for beautiful big-bodied, delicious Sitka bucks and the Kodiak experience is an affordable, unguided, DIY hunt all the way. How else can a nonresident experience Alaska to this extent for $2,600? And, it turns out, Kardiak Island is still plenty wild after all. It will be a long time before I no longer hear "the footsteps" when I first step into the bush.